Marsha has more than 30 years’ experience in the property-management and real- estate fields, 25 of those years at Sudler. She oversees a department staff responsible for client accounting and financial reporting. Marsha has comprehensive knowledge and practical expertise in all areas of real- estate financial reporting, including commercial, rental, condominiums, and co-operatives. She has held positions as Controller and Financial Analyst for local real- estate companies. She also served as Property Manager for condominium associations, commercial buildings and rental properties. As a consequence, few people can match her expertise across these disciplines. And as to accuracy, it’s no exaggeration to say that Marsha knows where every penny comes from, and where it goes. 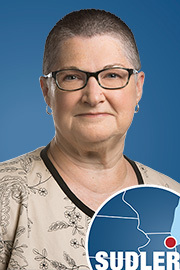 Known for getting the job done no matter what it takes, Marsha’s accomplishments include seamless conversions of manual accounting systems to computerized software, streamlining collections, and continual upgrading of accounts receivable and payable procedures. Her ability to simultaneously maintain a detailed grasp of financial-reporting statistics for every Sudler client is uncanny. “Stump Marsha,” is a game no one has ever won.